Practice without any sense of limit or position. Practice without any sense of clarity or distortion. Practice without any sense of movement or change. Practice without any sense of depth or surface. Practice without any doubt or hesitation. Showing her how to sit and direct her mind, he set her to practice. to clear away doubts and impediments. But a little uneasy about bringing clouds into the practice. Please give me instruction on practicing with clouds. But a little uneasy about bringing stars and planets into the practice. Please give me instruction on practicing with stars and planets. But a little uneasy about bringing in grass and trees. Please give me instruction on practicing with grass and trees. But a little uneasy about bringing thoughts into the practice. Please give me instruction on practicing with thoughts. 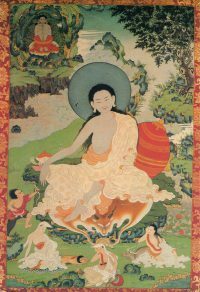 Milarepa thought that her practice was productive and was delighted. Clouds are the sky’s magical creations. Planets and stars are their magical creations. Be the sun and moon. Grass and trees are the mountain’s magical creations. Waves are the ocean’s magical creations. Thoughts are the mind’s magical creations. describes his meeting with the Lady Paldarboom. Milarepa lived in the 11th and 12th centuries and was totally steeped in a mythic culture. His path of practice was emulating past perfection: following his guru who followed his guru. But even if you’re raised in a mythic culture and accustomed to emulating past perfection, at some point you have to make the practice your own, to internalize it: what does it actually mean to me? That’s what Milarepa did: when he’d had his formal training, he went off and practiced in the mountains. People would come to him to ask about something, and he would say, “here’s what it means to me”. A lot of Milarepa’s songs are very personal, non-standard interpretations of traditional Buddhist material. And that’s why his songs have been so valued in the Tibetan tradition: they are not particularly scholastic, but they are very alive because Milarepa was just saying, “OK, you asked me about this, here is what I have experienced.” In this song, a woman came along and asked Milarepa how to meditate. Milarepa’s “Song to Lady Paldarboom” is the result. It’s all really alive — spontaneous and natural.